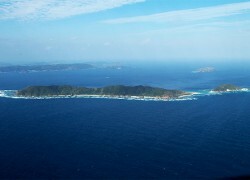 Mae Island is located about seven kilometers to the east of Tokashiki Island. North of Mae are Hate Island and Naka Island, which are generally included when referring to Mae Island. This island is popular for fishing and diving. Visitors can get to the island by charter boat or by a tour arranged by a travel agency. The cost for a round trip from and back to Tokashiki Island by charter boat can range between 30,000 yen and 50,000 yen. As there is no accommodation on the island, Mae is suitable for day trips only.